A part 1920s, part Victorian seven bedroom detached property with a detached one bedroom cottage accessed via a sweeping tree lined drive and set in over 9 acres of grounds. The property was refurbished recently with careful attention paid to blending retained period features with modern contemporary styling. There is over 6,800 sq. ft. of accommodation including a detached self-contained one bedroom cottage with a kitchen/breakfast room, a sitting room, a cloakroom and a first floor bedroom and bathroom. The main house has three reception rooms, all with retained features, a bespoke fitted kitchen/breakfast room and a garden room. In addition there is an attached single storey wing with a family room, a games/sitting room (or cinema room if required), a bar, a utility room, a boot room and a gardeners WC. The bedrooms are on the first and second floors, some currently configured as dressing rooms, and there is an en-suite bathroom and a family shower room. The original property dates from Victorian times with the elegant facade added in 1923 during the Arts and Crafts period. 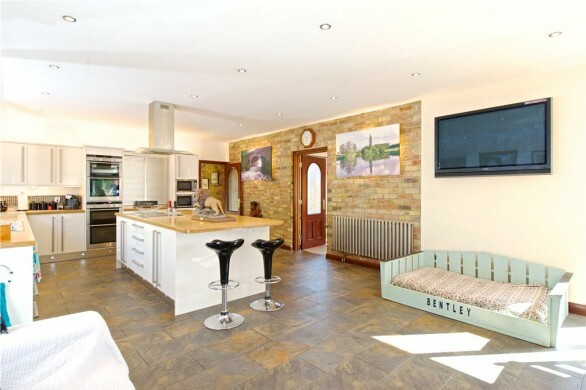 The Manor occupies a private setting on the edge of the village and is accessed via a long sweeping gravelled driveway which leads to the front of the house, and continues at the side to the garaging and outbuildings. The reception hall features exposed stripped and polished floorboards, exposed timbers and cornices and a gentle rise full turn staircase with individual balustrades and oak handrails to the first floor. Steps lead down to the cloakroom which is fitted in a contemporary style white suite of a wash basin and WC with complementary tiling. The rear hall has a fitted storage cupboard, a quarry tiled floor and stable door to the terrace. The boiler room has two gas fired boilers and houses the electricity consumer unit and fuse board. The sitting room features two mullioned leaded light bay windows, a mullioned fireplace surround with an oak mantel and an open grate, and moulded ceiling cornices. The dining room is dominated by the mullioned fireplace set into a recess with a high oak mantel and windows set either side. There is an exposed oak parquet floor arranged in a Herringbone style, exposed painted ceiling timbers and a dresser recess and serving hatch to the kitchen/breakfast room. The study/snug has a bay window, a mullioned fireplace set in an oak mantel and surround, and moulded ceiling cornices. The garden room has previously been extended and has a vaulted glazed ceiling with skylights, an exposed porcelain tiled floor and glazed double doors to the side. The family room has an exposed parquet floor arranged in a Herringbone style. 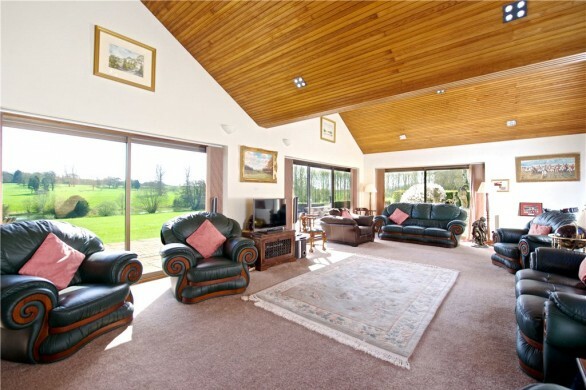 The games/recreation room has a high vaulted ceiling detailed with exposed beams and timbers, full length glazed doors to a terrace area and a deep fireplace recess with a raised hearth and housing a log/multi fuel style stove. The bar is fitted in a bespoke range by Mark Wilkinson and has dual aspect full length glazed doors to the terrace. The kitchen/breakfast room is fitted in a bespoke range of hand built cabinets which include glazed display cabinets and deep shelved storage cupboards, with complementary granite work surfaces over. There is a central island unit which has a marble work surface and incorporates a breakfast bar. Integrated appliances include an induction hob, a conventional electric oven, two grills, a combination oven, plate warming drawer and a dishwasher. Windows to the side overlook the raised terrace area enclosed by balustrading. The utility room has a high part vaulted ceiling and space and plumbing for a washing machine and tumble dryer and additional white goods if required. The boot room has a cupboard housing an additional consumer unit and a door to the rear. The part galleried landing has plaster detailing to the ceiling, and stairs to the second floor. The master bedroom is dual aspect and has exposed floorboards which continue into a sitting room/bedroom five. Bedroom three is currently being used as a dressing room to the master bedroom and is fitted in a custom built range of bedroom furniture. The en suite is fitted in a white traditional range of sanitary ware with gold taps and fittings and includes a slipper bath, a walk-in screened shower area with a fitted power shower, twin wash basins set into gold wash stands with marble shelving over, and a high level WC. There is complementary marble tiling. The guest bedroom has a traditional fireplace, and a bay window with a seat and storage under. Bedroom four has a traditional fireplace. The family shower room is fitted in a white traditional style suite and has a walk-in screened shower enclosure, a wash basin set into a floating vanity unit, and a WC. The second floor has been converted into a complete dressing suite and the landing and the two rooms are all fitted with bespoke bedroom furniture. There are sloping ceilings with inset Velux skylights. This floor could be converted back for use as additional bedroom space if required. Manor Cottage is a fully self-contained annexe of brick construction under a pitched tiled roof. The hall has stairs to the first floor with a cupboard under, a Porthole window, and a cloakroom with a vanity wash basin and a WC. The kitchen/breakfast room has a modern range of units with granite work surfaces and a sink unit. Integrated appliances include an electric oven, a hob with an extractor over, a dishwasher and a fridge/freezer. The room is open plan to the dual aspect sitting room. The utility room has a modern range of units and work surfaces with an inset Belfast sink, and space and plumbing for a washing machine and tumble dryer. There is a timber door to a porch area. The landing has an airing cupboard with a pressurised hot water cylinder. The dual aspect bedroom has a high vaulted ceiling. The modern bathroom has a double ended bath, a screened shower enclosure, a vanity wash basin and a WC. There is complementary tiling and dual aspect windows. The principal outbuilding is of brick construction with rendered elevations under a pitched tiled roof. There is a double garage and a separate garden machinery barn to the side entered via timber full height sliding doors. In addition there is a further garage, with space for four cars, which is entered via remote up and over doors, and a single garage with twin timber doors. There is a bespoke greenhouse with power and water connected and a potting shed. There is a fully enclosed dog run and kennelling enclosed by iron railings. A further detached garage block has space for six cars and is accessed by remote up and over doors. Between the property, annexe and garaging/outbuildings is a walled terrace area which conceals the LPG tank (underground). The outside cloakroom has a WC and a wash basin. The plot extends to approximately 9 acres and includes well maintained gardens which surround the house. To the front there are lawned areas with a variety of mature trees including fruit trees, an ornamental pond with steps up to a raised sitting area, and well stocked shaped borders. Beyond the lawned area, on the right of the driveway, is the leisure area with a tennis court enclosed by chain high fencing and a heated outdoor swimming pool which is of varying depths and is set into a lower terrace which is part walled, part fenced. There is also a brick built tennis pavilion which could also be used as a changing room. 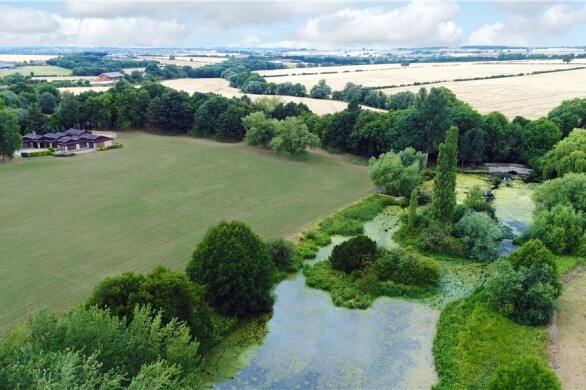 There is a terrace surrounded by ornate balustrades and a meadow which adjoins surrounding open fields and has mature trees including fruit trees, and a natural pond which has a bespoke wooden sitting area. Within this area is a public footpath which continues through this and the neighbouring property&#039;s grounds. The paddock is situated to the right hand side of the lawned area and is independently accessed from both the road and the rear of the plot. It is fully enclosed by both post and wire and post and rail fencing. Yielden is a small rural village set in open countryside on the Bedfordshire/Northamptonshire border. It has a church and a village hall used for community activities. Lower schooling is found in the nearby village of Riseley and the village also lies within the catchment area of Sharnbrook Academy. The Harpur Trust schools are in Bedford 12.4 miles away. Other accessible private schools are Kimbolton 7.1 miles away, Oundle 15.5 miles away, Uppingham 26.3 miles away and Oakham 32.4 miles away. Both the M1 and A1 are easily accessible by the A45 and A14 and there are regular trains from both Bedford and Wellingborough to London. Rushden provides local shopping within the new Rushden Lakes Complex as well as a Waitrose supermarket. There are also extensive shopping facilities in Bedford, Milton Keynes and Northampton.